We entered the 110 MPH class. Our actual speed was 110.0467 MPH for the 90 miles. We were 1.2 SECONDS early after 49 minutes of driving, and captured a third place trophy. 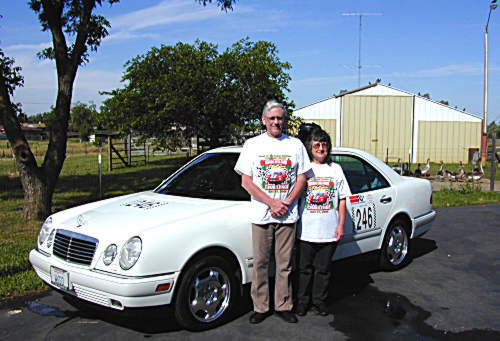 Larry Hall took first place at 110.0018 MPH and Pat Baumgarten was second at 109.9818. Duane Bily was fourth, at 110.0468 MPH, only .0001 MPH from us! 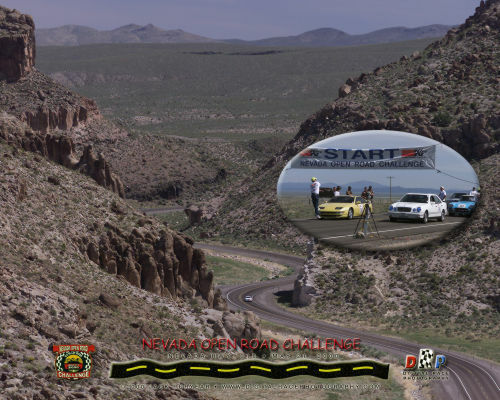 There were 39 entries in our 110 MPH class. The SSCC organized and put on a wonderful event. Out of 233 entries, there were only two MBs. How about joining us as "Team Mercedes"? We only need ten entries to field a team. 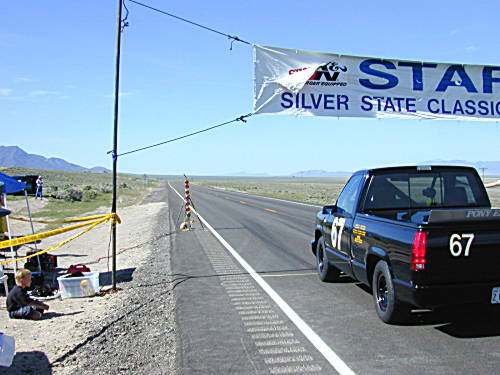 For more information on the race: Silver State Classic Challenge. 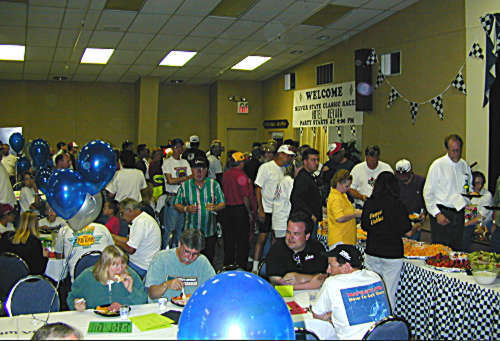 Click here for our September 1999 race pictures. Here we are, Jan and Jay O'Brien, ready to don helmets! Thanks to Tom Palmer (that's his yellow Nissan) for taking this picture. 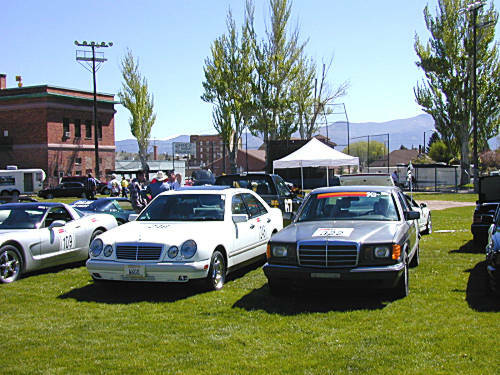 "3rd PLACE DRIVER, 110 MPH, Nevada Open Road Challenge, May 21, 2000"
"OFFICIAL FINISHER, Highway 318, 2000"
"3rd PLACE NAVIGATOR, 110 MPH,Nevada Open Road Challenge, May 21, 2000"
The beautiful 3rd place trophies are 10" high. 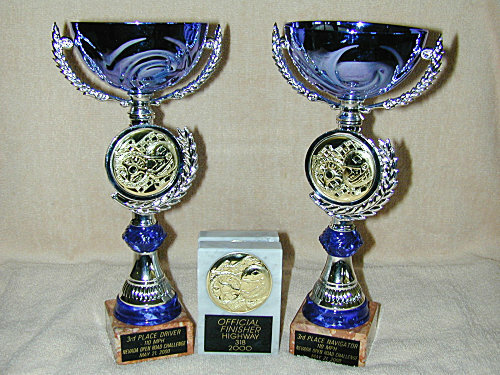 The Center marble trophies are handed to all finishers at the finish line. 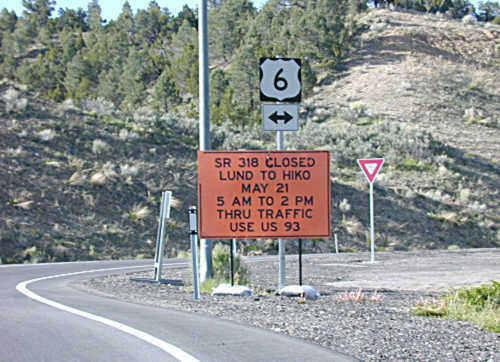 Nevada Department of Transportation does their job for us. 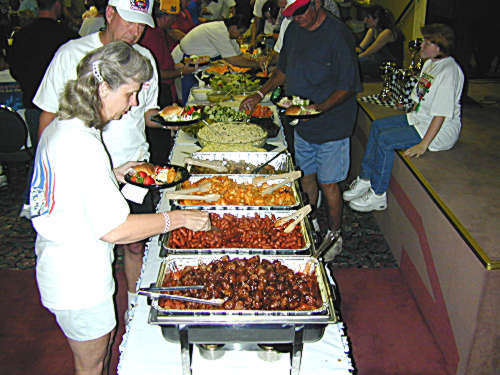 We were a hungry crowd! 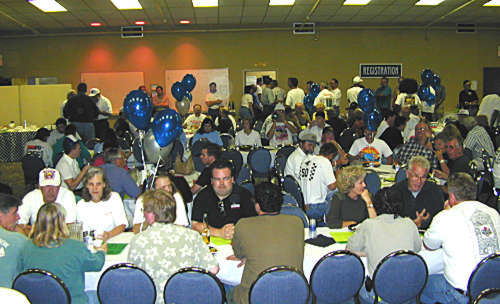 Note the crowd in the distance going into the registration room. 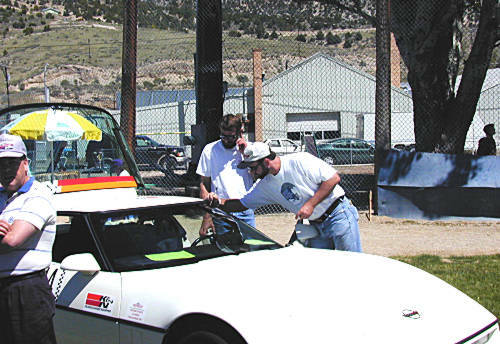 The Technical Inspection stickers are in place, we passed! Tire consultant Eric Petterson signs off. 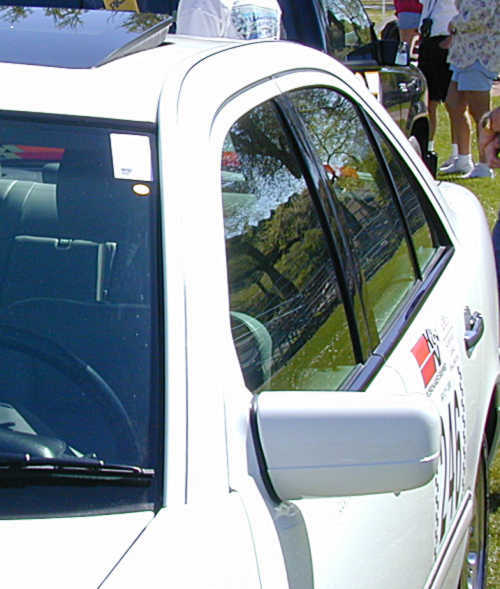 The O'Brien's E420 on the left, the Lumas' 300SD on the right. 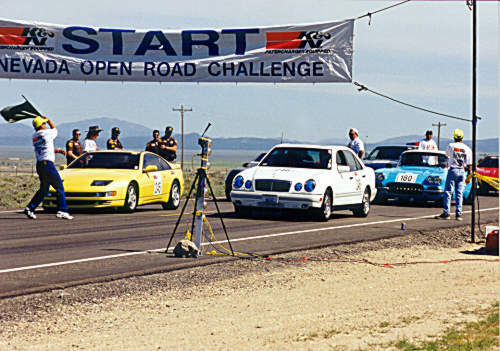 And, Pat Baumgarten, in car 109 on the left, finished second in the 110 mph class. 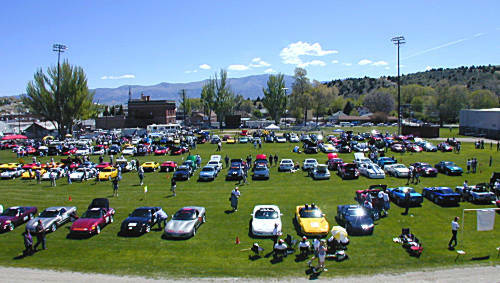 The Saturday car show at Broadbent Park. Lots of sun this time! 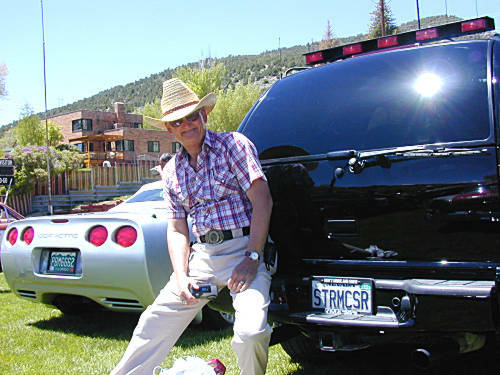 Media interface, webmaster and stormchaser Phil Henry, K6MAS. 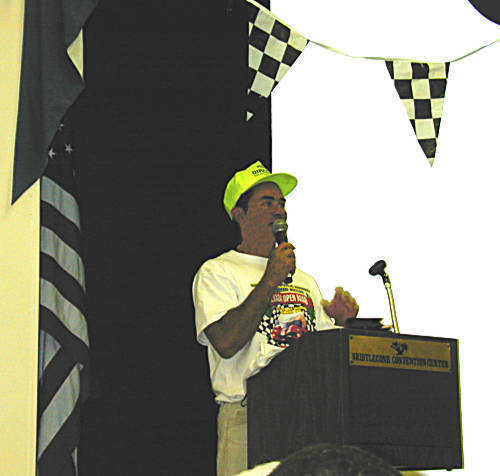 Race Director Gary Patterson gives us the word at the Driver's meeting Saturday. 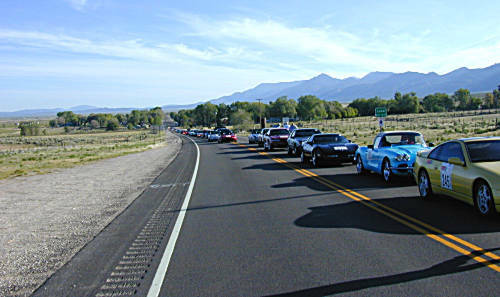 It seemed like the cars stretched the 30 miles back to Ely! 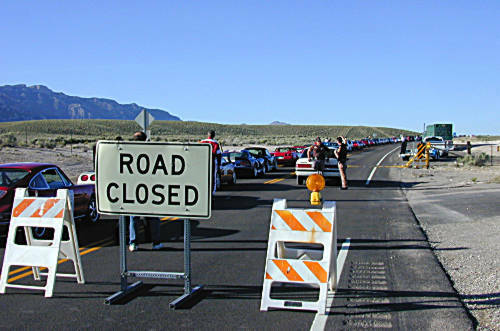 Nevada's finest made sure we were the only cars on the road. Don BrOwn at the start line. Note the "Christmas tree" of lights which announce when to go. Here we are, coming through the narrows at 100 MPH. Al and June Lumas after finishing the race. See the smiles! 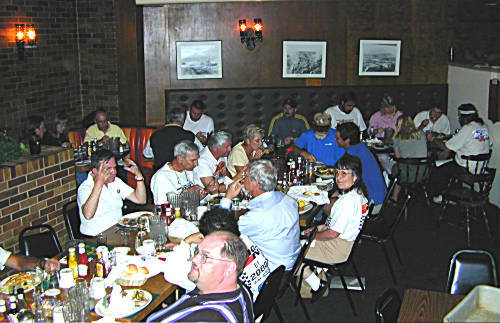 A great (alternate) dinner Sunday at Hotel Nevada in Ely. 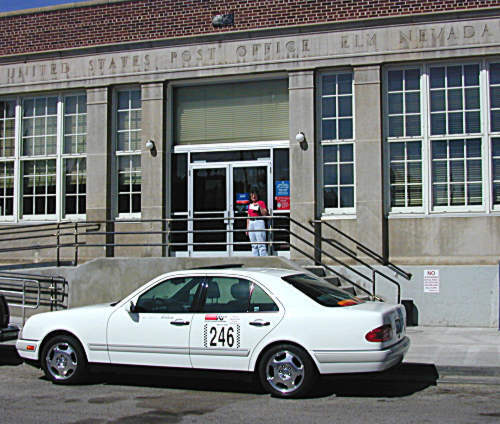 Here's Jan, mailing our deposit for the September race. Home again in Rio Linda, California. 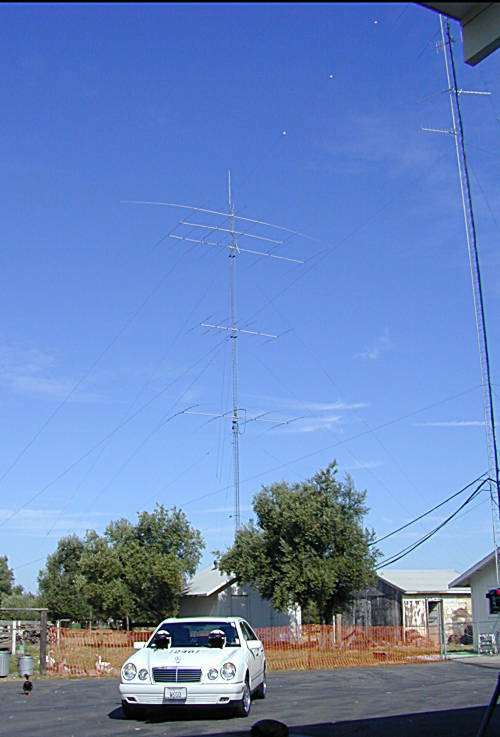 Ham radio is another hobby. Note the rotator half-way up the 155' tower.